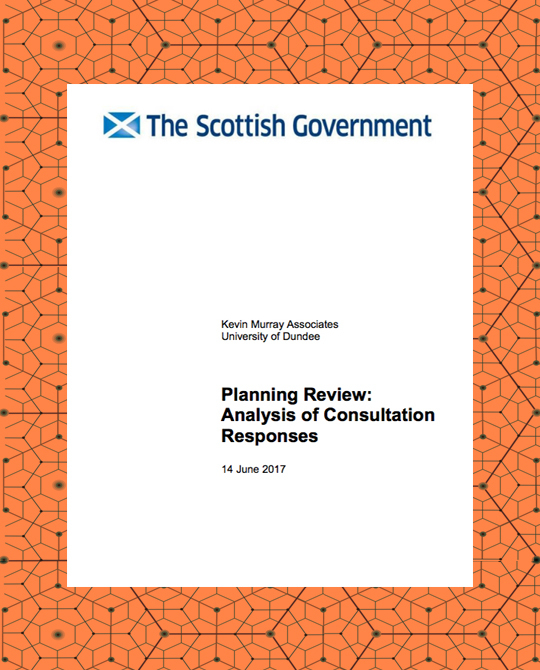 We are pleased to announce that the report from our commission to analyse the latest evidence submitted to the Scottish Government’s Planning Review has now been published on the Scottish Government Website. Undertaken with the University of Dundee and Eclipse Research Consultants, the project involved the analysis of the 474 written submissions, using a cross-coding system, that was undertaken during the months of April and May following receipt of all the submissions. We structured the analysis around the four main themes of the Review, seeking to draw out the major areas of agreement and concern from across the full body of submissions. We have presented the findings to the Planning Review Team and had an engaging dialogue around the themes and ideas. We are due to present the findings to RTPI Young Planners and West of Scotland Chapter on 6 September. We had a very challenging time working through such diverse qualitative data in an extremely tight timeframe, so we would like to acknowledge the efforts of our whole team of Rim Chouaib, Dr Ian Cooper, Iain MacPherson, Kevin Murray, Michael O’Sullivan, Dr Husam Al Waer and Frances Wright. Good luck to the Scottish Government Planning Review team taking the ideas and aspirations forward to the next stage.